Released in October 2002, TimeSplitters2 sees an alien race called the TimeSplitters attempt to destroy humanity by travelling throughout time using Time Crystals and stopping its history from happening. Two space marines have just reached a space station which is overrun by the TimeSplitters, and are preparing to create time portals to run after the TimeSplitters and stop them. They are then attacked and one of them decides to stay behind and defend. It is up to a lone soldier to defeat the hordes of the aliens throughout history, but is he too late? Best time on Easy difficulty: Single-segment 0:27:20 by Stefan 'Anemptybox' Persson on 2014-03-25. First of all, thanks for stopping by. 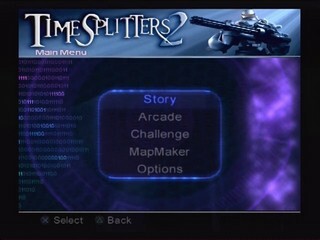 If you're interested in seeing more TimeSplitters runs, head over to my YouTube channel at https://www.youtube.com/user/Ace900809. I have many more world records for all three TimeSplitters games and most of them are on video. I play both Story mode (I've got several Hard mode videos) and Challenges/Arcade Leagues, and I also sometimes make interesting non-speedrun videos about the games. I also stream every now and then at http://www.twitch.tv/anemptybox. I hope you'll enjoy this single segment run. Also, big thanks to nate for encoding and SDA for being an awesome site! This is a run I've wanted to do for a quite a long time. My previous best was 27:35 which, until now that is, was the former WR for this category. My goal was to get a sub 27:30 run and I think this run went really well, but there are of course always a few things that could've gone a bit better which I'll explain now. Siberia: It's easy to notice but I guess I should still mention that being shot by enemies in the back boosts you forward. One single boost doesn't save much time, but if you manage to manipulate it well throughout a full Story run, it can save a few seconds in total at least. Moreover, you also want to avoid getting shot in the front since that'll slow you down instead. The only thing I can write about Siberia is that it went well but I could've gotten one or two more boosts. Chicago: Here you see my shooting the enemy at the start to grab his attention so he'll return the favor by giving me a boost. Other than that, just run to Marco as fast as possible, protect him, and then run straight to the boss which pretty much went perfect here. Notre Dam: You need to be very careful so you don't set the maidens on fire on this level, but it worked out perfect on this run. To anyone wondering about the zombie I just run through; it's possible to do that when they're about to stand about. You can't do much about the undead priests that are on fire, blocking your way down the stairs, but it's possible that they won't follow you up if you're lucky. I kill the zombies myself instead of relying on Hunchback because he tend to screw up the run a lot of time. Rest of the run went well except a bit poor aiming on the first shots at the Daemon. Return to Planet X: You need to kill twelve aliens to make the laser disappear, and then another eight to make the portal appear at the ship. Pretty good run. NeoTokyo: Most boring level in the game to speedrun since all you do is wait for the majority of the level. To make things more interesting, I go around looking at stuff before the "actual" level starts. It seemed like Sadako/gang leader took way more hits than usual and the ending could've been smoother, but still alright. Wild West: Short level but it can kill your entire Story run if you miss shooting the Colonel at the end as soon as he go outside. Not much more to say. Atom Smasher: You can always be faster putting out the fires, but it's hard to do and almost seems a bit random. Not a great run but still okay for single segment, good ending. Aztec Ruins: Optimally, you want the second Golem to hit the switch himself and then fall down, but overall I didn't lose much time on this level. Robot Factory: I was pretty unlucky here. Got stuck a bit more than I usually do (it's pretty hard not to, though, a ton of enemies) and the very last node is strange: You can see me not doing much there because I'm waiting for the shield to disappear fast, which it only do if you're not looking at it. It didn't work on this run though (looks like the shield came back! ), so I still had to wait the normal amount of time so to speak. Other than these complaints, not that bad of a run. Space Station: Last few ships didn't want to blow up fast but other than that, not much to say. Some other good TimeSplitters players from the top of my head that have inspired me to become good at these great games: MepH, Silent Thunder, Fitzy, Matthijs Triep, ElitePhoenix, MegaDestructor9, Remlosh, SniperWD, SamShady, CP, failurewarning, Fauch, and so on and so on.